Storing school work can be quite a task. You want to keep everything yet you don't want it to keep you! As the school year starts to close for many, we are left with mounds of paperwork. What to do? 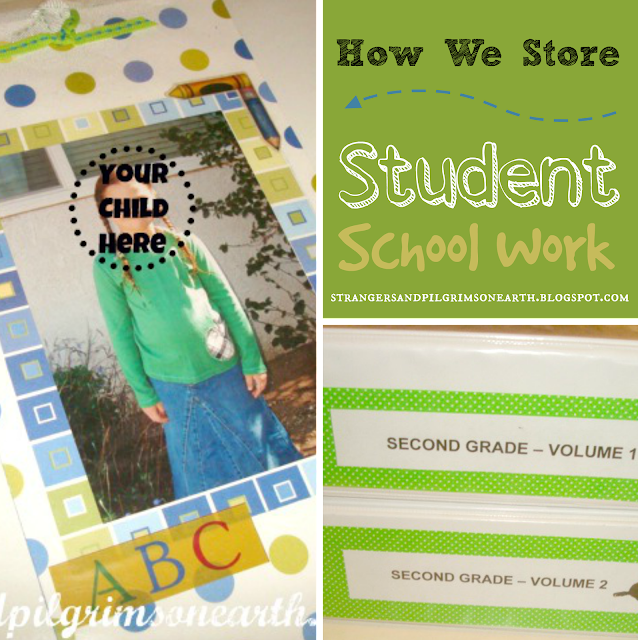 This is the way I organize our homeschool goods which also offers itself as a memory maker. 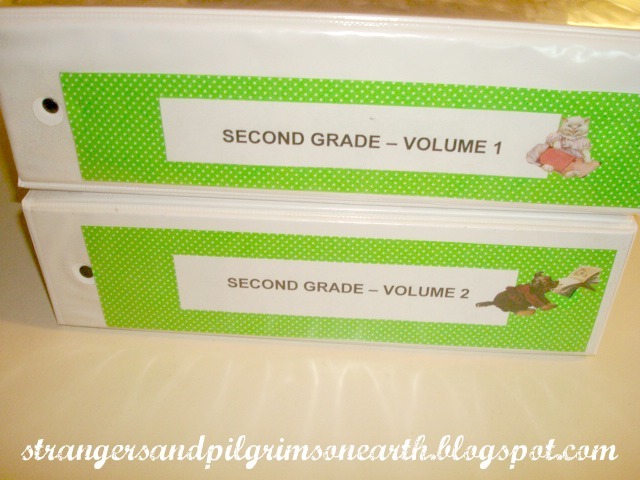 What I do is prepare two binders for each student per grade. I then take a "school picture" for the year and slip it inside the binder cover. 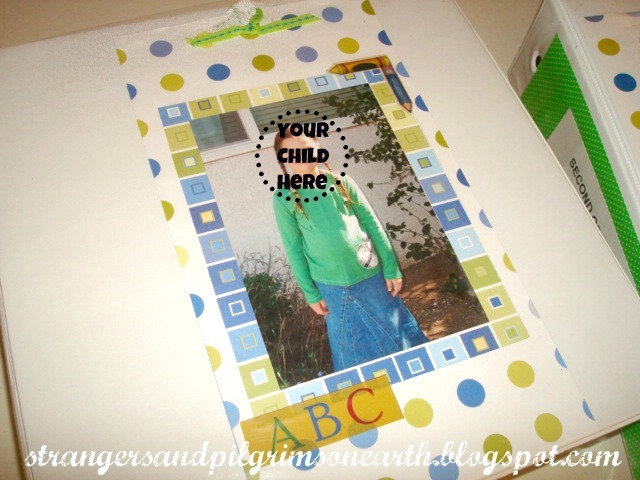 This serves to label the owner of the binder as well as providing a memory of what your child looked like at that specific age. It is also special to decorate the covers with scrapbook supplies, stickers or clip art. I must admit to color coding the binders according to their clothing in the pictures but that is just my obsessive compulsive nature coming out. You can also have your students do their own decorating and paper organizing as a year end project or beginning of the year project. Inserting tabs into your binders (such as Bible, science/nature, math, etc., or according to unit of study such as bees, pioneers, pilgrims and so forth...) is the final touch. Then I simply file the school work in the proper category. You can start this up at the beginning of the year and add as you go or you can prepare it at the end of the year once you know what you have to work with. It also helps to label the spine of the binders and it makes a pretty presentation on your school shelves. You can color code each binder to your children's favorite colors or you can just have fun and do whatever you please. I also include pictures of the field trips taken that year, pictures of larger projects, science experiments and charts that will not fit into the binder. I make little scrapbook sheets (or have students do their own) by pasting these pictures down on card-stock and jotting down a few words pertaining to them. Then, I simply place these memory pages into plastic sheet protectors to keep them safe in the binder. 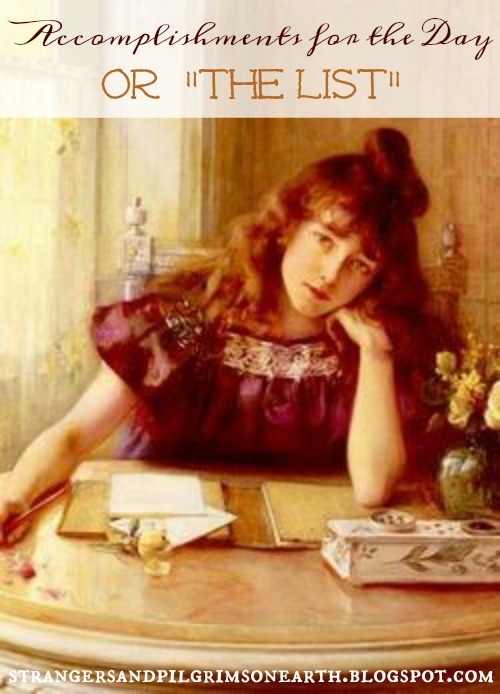 How do you organize your school work? for them that feared the LORD, and that thought upon his name." We as wives and mothers can get physically tired, mentally exhausted and very overwhelmed at times. When you add one extra burden or struggle into our hearts, it seems to bring everything to a head and we can feel so utterly alone. Ladies, do not be ashamed of those moments of weakness. Do not feel like a failure. More importantly, do not be too proud to accept encouragement and love when they are offered. Daily we draw our strength from the Almighty but there are times when God sends someone to give comfort and care. We must remember that His followers are also His instruments. Would you believe that Moses, the leader of Israel had these same struggles? He was given a work by God but was growing weary in it. In Exodus 17:11-12, we find him barely able to raise up his staff during a major battle and whenever he lowered it, the Amalekite enemies would prevail. Thus, his arms began to tire and soon he could no longer hold them up! What was to be done? Did not God give this responsibility to Moses? He had made it possible for him to part the Red Sea and bring water from a rock! Where was He now when his strength was failing? Please continue reading at Deep Roots at Home where we are guest posting today. All the fine print. This post may be shared with some or all of the following link-ups: The Art of Home-Making Mondays, Modest Mom Monday's, Monday's Musings, Make Your Home Sing Monday, Good Morning Mondays, The Scoop, Titus 2 Tuesdays, Tuesdays with a Twist, Raising Homemakers, Wise Woman Link Up, Homestead Blog Hop, Wow Us Wednesdays, Coffee and Conversation, Homemaking Thursdays, Home Sweet Home, Our Simple Homestead, Awesome Life Friday Link Up, Five Star Frou Frou Friday, and Shabbilicious Friday. Thank you lovely ladies for hosting these. This post may contain affiliate links (which are merchant links that help to support this site at no additional cost to you if you purchase an item through them). Painting is "Madonna of the Prairie" by W.H.D. Koerner. 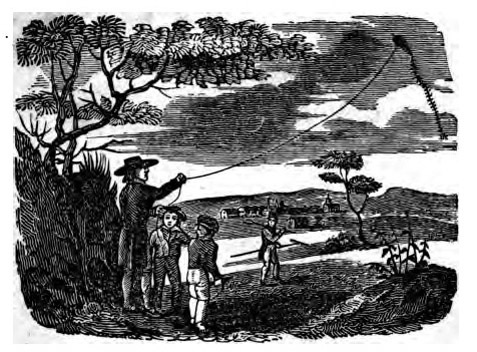 Kites are a pleasurable pastime in America though they are thought to have originated in China. The frame of the first kites are said to have been made with silk and bamboo. Sadly, many children today have never ran through a field with the wind in their hair and flown one. This is something we plan to do soon! We are going to attempt to make our own kites and fly them in our field. You can find directions here if you would like to try this. The art of kite making and flying utilizes the skills of arts and crafts (decorating and creating it), mathematics (measuring all the supplies and cutting to size) and physical education (when complete, you will need to run around to get it going). It can also cleverly include history and language arts when you introduce books about Ben Franklin and read kite related poems and stories. The science of air pressure can be taught through the example of the kite (here is an easy example for children). As you can see, it is a fun project that is also very educational. I love these types of teaching moments where no one realizes that they are learning! These make for excellent summer projects to keep the minds working and the hands busy. 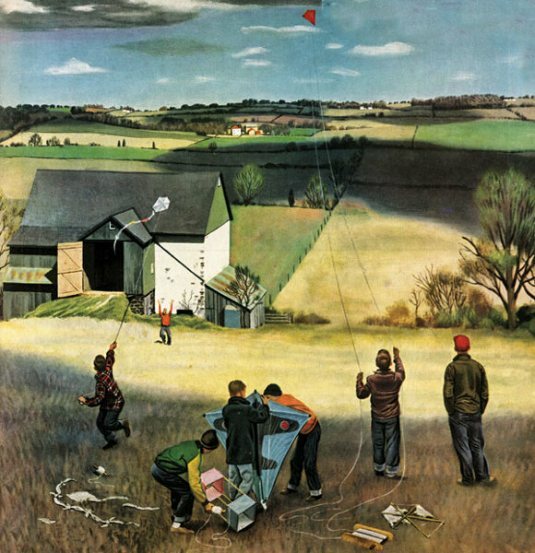 I saw you toss the kites on highAnd blow the birds about the sky;And all around I heard you pass,Like ladies' skirts across the grass—O wind, a-blowing all day long,O wind, that sings so loud a song! I saw the different things you did,But always you yourself you hid.I felt you push, I heard you call,I could not see yourself at all—O wind, a-blowing all day long,O wind, that sings so loud a song! O you that are so strong and cold,O blower, are you young or old?Are you a beast of field and tree,Or just a stronger child than me?O wind, a-blowing all day long,O wind, that sings so loud a song! so is every one that is born of the Spirit." “Eggs have two advantages over all other foods. 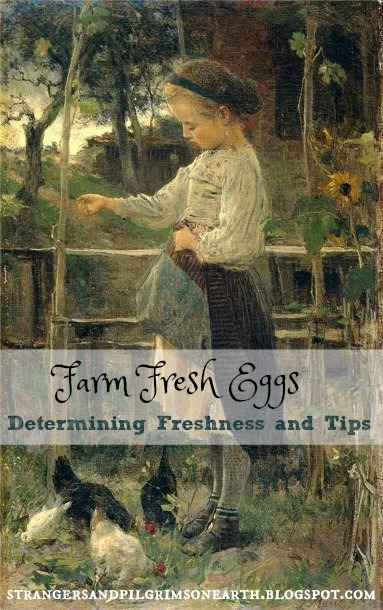 Do you have farm raised eggs? 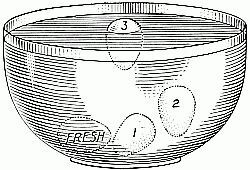 Below is a diagram which will help you to determine if your eggs are fresh. When in doubt, place them in a bowl of water and the results present themselves. All of the above are good to eat except for number 3… the floaters are most likely rotten. Fresh eggs do not peel well when hard boiled. If that is your intention, leave eggs out in room temperature for about two to three days prior to cooking in order to achieve an easier peeling experience. You can go crazy trying to peel a fresh egg! Crushed egg shells can be recycled back into the chickens feed as a calcium source providing they no longer resemble an egg (otherwise your chickens may begin to look at their eggs as food which is big trouble). Feeding chickens your table scraps is a great way to supplement their meals while limiting waste in your home. However, some foods are toxic to chickens such as raw potato peels, avocado (pits and skins) and rotten foods. It is also wise to avoid coffee grinds, chocolate (who would waste such a precious commodity anyway!) greasy foods, processed foods (we shouldn't be eating these things either!) and raw meat. The chicken came first. Just as God created Adam and Eve as full grown humans, all other animals in the beginning were created in their mature forms as well (making them ready to reproduce and populate the world). Here is where we order our chicks should you like to start your own coop operation for there is nothing like a fresh egg with orange yolks. All the fine print. This post may be shared with some or all of the following link-ups: The Art of Home-Making Mondays, Modest Mom Monday's, Monday's Musings, Make Your Home Sing Monday, Good Morning Mondays, The Scoop, Titus 2 Tuesdays, Tuesdays with a Twist, Raising Homemakers, Wise Woman Link Up, Homestead Blog Hop, Wow Us Wednesdays, Coffee and Conversation, Homemaking Thursdays, Home Sweet Home, Our Simple Homestead, Awesome Life Friday Link Up, Five Star Frou Frou Friday, and Shabbilicious Friday. Thank you lovely ladies for hosting these. This post may contain affiliate links (which are merchant links that help to support this site at no additional cost to you if you purchase an item through them). Painting is of "Feeding the Chickens" by Jacob Henricus Maris. In our last post, we discussed the importance of taking moments to love your family and not being ruled by the list of things to do in your household. Those thoughts usually only affect the "Martha" minded women who are task oriented and need constant reminders to stop and smell the roses. Today we are going to discuss the "Mary" minded women who can't seem to get everything together. What we must remember is that Jesus told Mary she had done the "good part" by staying to hear His life changing words of salvation to the soul. She was absolutely justified to sit at the feet of the Savior and just listen! However, it is because she had a "special guest" in her home that she was allowed this luxury. If women were to sit and read and reflect all day long in their daily existence, surely her home would become undesirable. There is a balance that must be found. We are called to be the "keeper at home" and that is a biblical task we should take with great care. 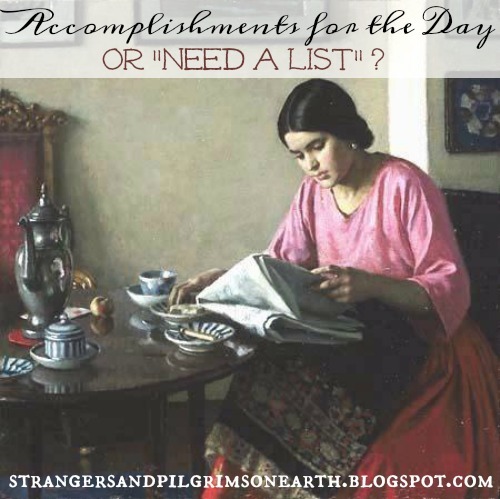 If you find it hard to commence your day, a list is an excellent place to start. The night before, write down anything that must be done. Give yourself little goals. When you complete certain items, allow yourself a few minutes of refreshment or rest. Make your bed (right away) each morning. Do all prep work for dinner during the quiet of the day (i.e., cut salad, chop any vegetables, marinate meat or prepare sauces and/or casseroles). Clean up the mess. There will be less dishes to do in the evening when you are tired. Set the table. Even if dinner isn't ready, this simple step shows care to your husband when he walks through the door. Straighten up the living room prior to your husband's return from work as this is where he and you will most likely rest together after the long day. Give your bathrooms a once-over daily. Most men are out all day in filthy, aggressive and stressful environments. By keeping your home a sanctuary, you are being such a blessing. You are doing him good (Proverbs 31:12)! Let your love shine for him by placing an importance on the home that he takes so much care to provide for. and eateth not the bread of idleness. her husband also, and he praiseth her." *Note: This post is geared towards the "Mary" minded women. All the fine print. This post may be shared with some or all of the following link-ups: The Art of Home-Making Mondays, Modest Mom Monday's, Monday's Musings, Make Your Home Sing Monday, Good Morning Mondays, The Scoop, Titus 2 Tuesdays, Tuesdays with a Twist, Raising Homemakers, Wise Woman Link Up, Homestead Blog Hop, Wow Us Wednesdays, Coffee and Conversation, Homemaking Thursdays, Home Sweet Home, Our Simple Homestead, Awesome Life Friday Link Up, Five Star Frou Frou Friday, and Shabbilicious Friday. Thank you lovely ladies for hosting these. This post may contain affiliate links (which are merchant links that help to support this site at no additional cost to you if you purchase an item through them). 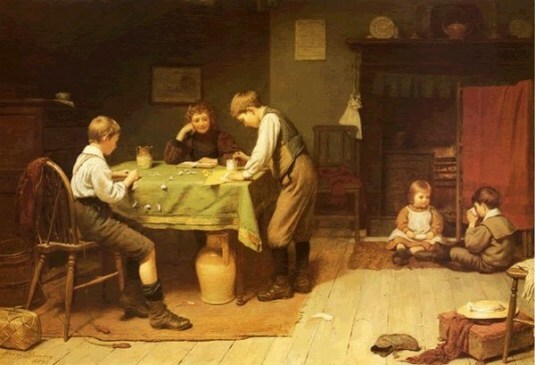 Painting is of "The Breakfast Table" by Harold Knight. Many women love to plan and prepare. I happen to be one of them. I set goals for myself and have an immense desire to check them off my list at the end of the day. I feel such satisfaction when that occurs! The sad part is that when it doesn't happen, I can get very frustrated (and it shows!) and wonder where did my day go? You feel like you weren't productive. The ceiling fans are showing signs of stalactites, the windows in your home blend in with your walls and the kitchen sink is full of dishes that require a pick and chisel to clean. You feel like a failure as you wonder (and are irritable!) what did I accomplish today? How many years was I influenced and flustered by these thoughts? How many hours did I waste in grouchiness trying to conquer those goals I set for myself? But most importantly, how many minutes and seconds of kisses and hugs did I rob from my husband and children while trying to bow down to the god that I created myself, "The List"? Of course, I would continue keeping the home (it is on the heavenly list!) and tackling those scientific phenomenons that were occurring in my little kingdom. I would even keep a list. The difference was, that I knew the God given responsibilities on the top were the priority. I was accomplishing much each day when I loved and served my family and I wasn't going to let my man made paper make a failure out of me anymore. but by the seeds that you plant." I am without a doubt one of them since I am the task oriented type. All the fine print. This post may be shared with some or all of the following link-ups: The Art of Home-Making Mondays, Modest Mom Monday's, Monday's Musings, Make Your Home Sing Monday, Good Morning Mondays, The Scoop, Titus 2 Tuesdays, Tuesdays with a Twist, Raising Homemakers, Wise Woman Link Up, Homestead Blog Hop, Wow Us Wednesdays, Coffee and Conversation, Homemaking Thursdays, Home Sweet Home, Our Simple Homestead, Awesome Life Friday Link Up, Five Star Frou Frou Friday, and Shabbilicious Friday. Thank you lovely ladies for hosting these. This post may contain affiliate links (which are merchant links that help to support this site at no additional cost to you if you purchase an item through them). 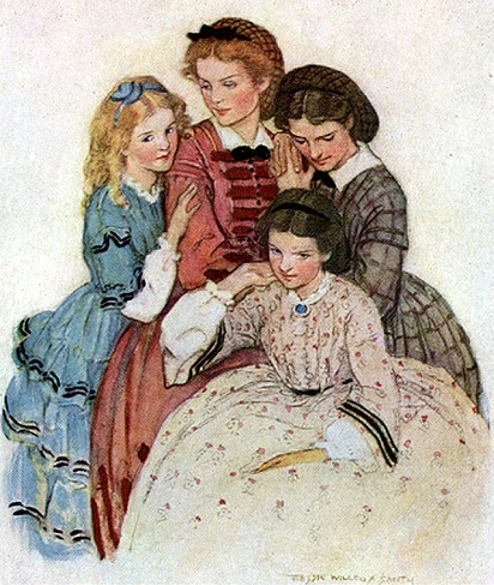 Painting is of "The Letter" by Albert Finch. 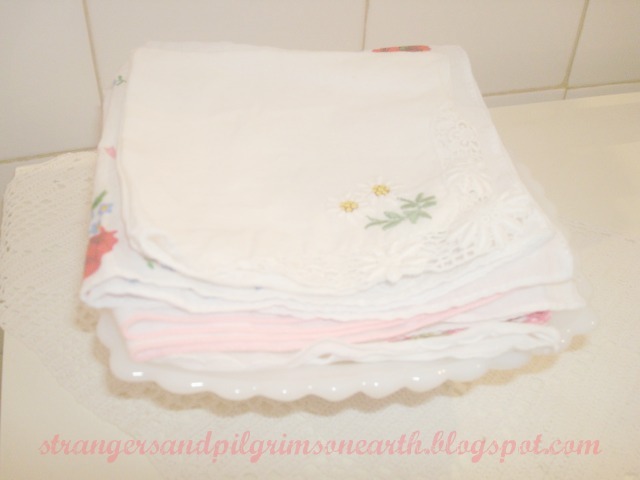 with her handkerchief at her eyes…"
Handkerchiefs, once a necessity in days gone by, are still a favorite of mine. 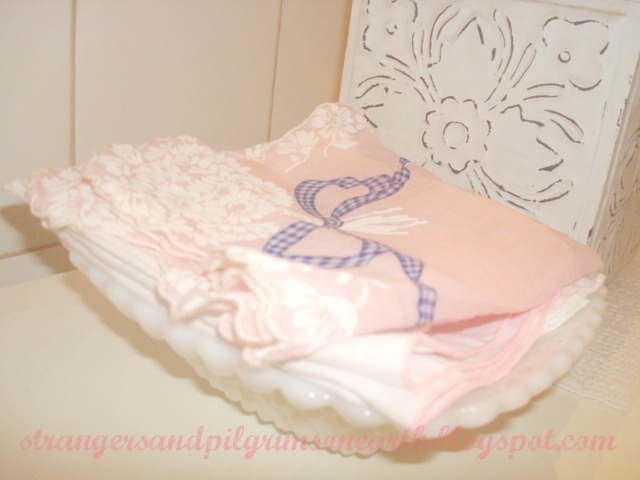 Do you remember those lovely pieces of cotton? I have a small collection and am always looking for ways in which to employ them. One day it dawned on me, I could use them just as they were originally intended but with a slightly modern twist. 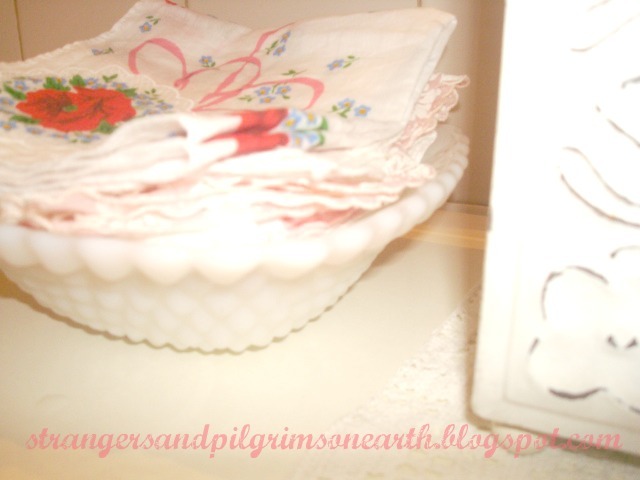 "...and covering her face with her handkerchief, Elizabeth was soon lost to every thing else…"
I placed a "heap of hankies" in a small dish and displayed them in the bathroom where they would most likely be needed. As you would a box of tissue, just take when needed. The only difference would be that the used product goes into the laundry basket instead of the waste basket. Thus, this is very beautiful for the budget and a pretty way to practice good stewardship. That's like you, dear! What will we get?" exclaimed Jo. "I shall give her a nice pair of gloves." "Army shoes, best to be had," cried Jo. "Some handkerchiefs, all hemmed," said Beth. 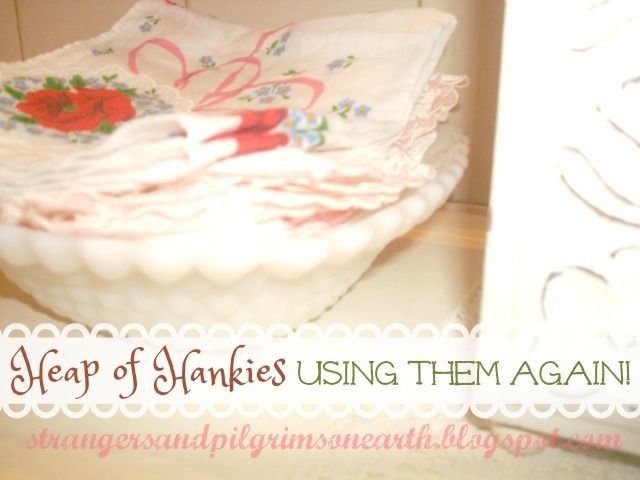 Use in place of a doily (or under a vase of cut flowers). Cover your ferments with them (such as your kefir and kombucha jars). Frame your favorite designs as works of art. Sew a grouping together to make a table runner. 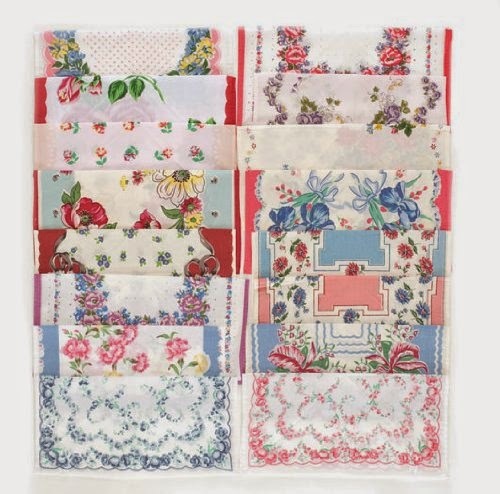 Attach a row of them to your cafe curtains to make a pretty valance. Flowers are such a beautiful display of God's creation and I love them dearly-- but sometimes it breaks the bank to plant them! Cuttings are an excellent way to establish a garden without paying a penny. 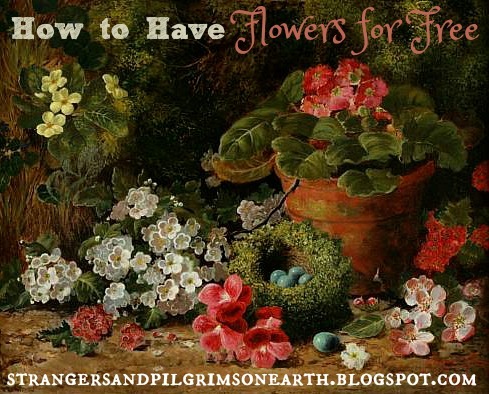 What you need are either some flowers in which to propagate or a friend or neighbor with a thriving garden. This method works well with sturdier and thicker stemmed plants. Delicate designs are not good choices as they will most likely wilt in the process. Geraniums are probably the easiest plants to start off with because success is almost certain. To take a cutting, choose a strong stem with a few open leaves. Cut the stem just below a leaf at an angle and peel off the lower leaves on the bottom part of what you just cut. Place this cutting into a small pot filled with potting soil (I used regular soil but the experts recommend a combination of peat moss, perlite, vermiculite) and press the plant firmly in place. Keep the soil moist and make sure there is adequate drainage. Once you notice the plant has begun to grow its own leaves and settle in, you can transplant it anywhere in your garden, hanging planters or window boxes provided the conditions are beneficial to the plant. The best time to take cuttings is in the morning. Keep the cuttings cool and moist until you are ready to plant. You can store the cuttings in wet paper towels prior to using or store in plastic bag in refrigerator. Place pot in indirect sunlight until it flourishes and is ready to be transplanted. Place a plastic bag loosely over the plant allowing for some air to pass through. This will provide some humidity and lock in some moisture which is necessary. I am going to attempt some cuttings with my hydrangeas this year. The instructions are basically the same as above although it may be beneficial to dip these cuttings in a rooting hormone prior to planting. A six inch cut from the top of the plant and removal of the lower leaves is also recommended. Are you ready to create your own little Garden of Eden? All the fine print. This post may be shared with some or all of the following link-ups: The Art of Home-Making Mondays, Modest Mom Monday's, Monday's Musings, Make Your Home Sing Monday, Good Morning Mondays, The Scoop, Titus 2 Tuesdays, Tuesdays with a Twist, Raising Homemakers, Wise Woman Link Up, Homestead Blog Hop, Wow Us Wednesdays, Coffee and Conversation, Homemaking Thursdays, Home Sweet Home, Our Simple Homestead, Awesome Life Friday Link Up, Five Star Frou Frou Friday, and Shabbilicious Friday. Thank you lovely ladies for hosting these. This post may contain affiliate links (which are merchant links that help to support this site at no additional cost to you if you purchase an item through them). Painting is Primroses, Geraniums and a Bird's Nest by George Clare. 'Not half so good as yours, mother. Here it is, and we never can thank you enough for the patient sowing and reaping you have done,' cried Jo, with the loving impetuosity which she never could outgrow. 'I hope there will be more wheat and fewer tares every year,' said Amy softly. 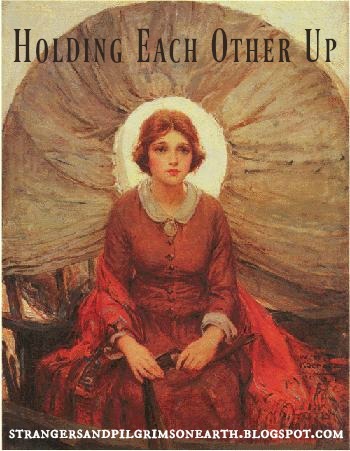 'A large sheaf, but I know there's room in your heart for it, Marmee dear,' added Meg's tender voice. "Lo, children are an heritage of the Lord…"
All the fine print. This post may be shared with some or all of the following link-ups: The Art of Home-Making Mondays, Modest Mom Monday's, Monday's Musings, Make Your Home Sing Monday, Good Morning Mondays, The Scoop, Titus 2 Tuesdays, Tuesdays with a Twist, Raising Homemakers, Wise Woman Link Up, Homestead Blog Hop, Wow Us Wednesdays, Coffee and Conversation, Homemaking Thursdays, Home Sweet Home, Our Simple Homestead, From the Farm Blog Hop, Front Porch Friday Blog Hop, Awesome Life Friday Link Up, Five Star Frou Frou Friday, Shabbilicious Friday, Simply Natural Saturdays and Clever Chicks Blog Hop. Thank you lovely ladies for hosting these. This post may contain affiliate links (which are merchant links that help to support this site at no additional cost to you if you purchase an item through them). Bees are an excellent spring study choice for children that also offers much in the character building department. You will be amazed at these little creatures whom God made to do great things! "Don and Joyce are invited to spend the summer with their grandparents at the farm. Each day presents exciting opportunities for them to experience outdoor farm life-so different from the city-especially the first day when they encounter a hive of angry bees. From this episode grandma chooses stories from her scrapbook and skillfully develops some character lessons for each evening bedtime BEE-STORY. Contents: Bee Obedient; Bee Honest; Bee Truthful; Bee Kind; Bee Polite; Bee Gentle; Bee Helpful; Bee Careful; Bee Grateful; Bee Loving; Bee Accepted; Bee Confident; Bee Content. Recommended for ages 5 to 10." I would suggest reading together from the above chapter books for 1/2 hour a day. Read one of the pictures books per day and have your children do some of the listed activities below each day according to their abilities. Include all work separately in a notebook/binder or composition book for each child. Don't forget to let them decorate their own covers with pictures of bees, stickers or bee clip art! Encourage them to be creative. 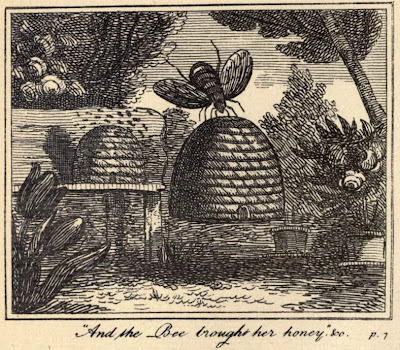 By the end of a few weeks you will have a nice collection of "bee scrapbooks" to cherish as an educational keepsake. Suggested Spelling/Vocabulary List: Make sure to have a "Spelling Bee" at the end of the unit! Bible/Penmanship: Copy a Bible verse a day about bees and/or honey in your best writing making sure to include all proper punctuation. Bible Discussion: Read Proverbs 25:16 about eating "just enough" honey. Talk to your children about "over-eating", the sin of gluttony, and self-control. lest thou be filled therewith, and vomit it." Bible Discussion: Read the Proverb below to your children and discuss the meaning together. "Pleasant words are as an honeycomb, sweet to the soul, and health to the bones." Language Arts/Penmanship: Have your children copy the following poem in their best writing or cursive making sure to use all the proper punctuation. You can also have children memorize this poem if you like. With the sweet food that she makes. Language Arts/Grammar: Have your students point out all the nouns in the first paragraph. Have them point out the verbs in the second paragraph. Have your children explain to you what the third paragraph means. Lastly, see if they can point out the adjectives in the last paragraph. 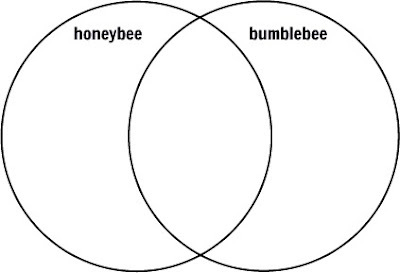 Language Arts/Grammar: Discuss "homophones" with your children using the example of "bee" and "be". See if your students can come up with more examples. Older children can write them down. Language Arts/Grammar: Teach your children about similes using the following terms. A simile is a figure of speech that directly compares two different things, usually by using the words "like" or "as". Science/Nature: Diagram a bee and label the parts. 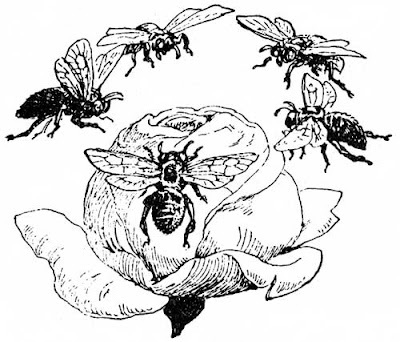 Science/Nature: Explain the different purposes of the queen bee, worker and drones. Science/Nature: Make a list of the different types of bees (e.g., honeybee, bumblebee, carpenter bee, etc.) and then have the older children alphabetize it. 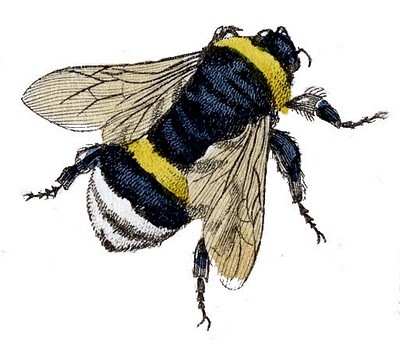 Science/Nature: What is the differences between a honeybee and a bumblebee? Do a venn diagram making sure to place the similarities in the middle and the differences on the proper sides. 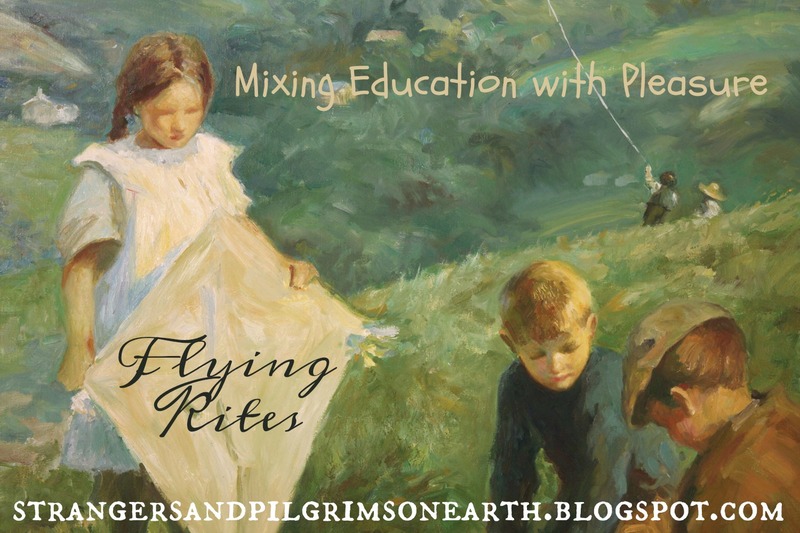 Science/Nature: Learn about pollination. Older children can write a short paragraph to explain it while younger ones can narrate to mother how it works (or they can illustrate it). Discuss the importance of pollination to our food sources. What would happen if bees were no longer here to pollinate crops? Science/Nature: Have your children draw and label the four stages that the bee undergoes (egg to larva, pupa then adult). Science/Health/Research: Research the health benefits of honey and have your older children do a short report on the subject. Another subject to research would be the medicinal cures used with honey. "My son, eat thou honey, because it is good; and the honeycomb, which is sweet to thy taste…"
Science/Nature: Bees produce many products which are beneficial to man. Make a chart of what is gleaned from the bee and its specific uses. For example, bee pollen, royal jelly, honey, beeswax, and propolis. Science/Research: Research what to do in case you get stung by a bee. There are some natural remedies that help with the pain. Write out a list. If any one in your family is allergic to stings then this would be a great time to discuss what to do should this emergency occur. Literature/Character Building: Read aloud "The Law of Authority and Obedience" by Margaret Gatty from "Parables From Nature" (link will take you to the story for free). The bees in this Victorian piece of literature will teach your children about authority, obedience and nature around them. Great discussion in the family will surely follow. Geography: Using the map above, have your children find their state and explain what the major sources of pollination for bees are in your specific location. 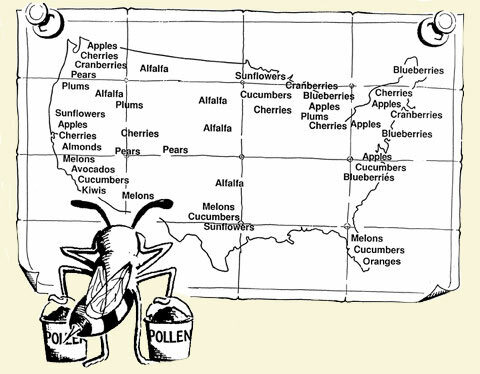 You can also name a few other states and have them tell you their source of pollination as well. They may need a physical map of the United States to help them identify the states better. History/Research: People have found honey in tombs that was still very edible! Do a report on this amazing food in relation to Egyptian history. Current Events/Science/Nature: Older children can research why bees are becoming scarce and write a report about it. Home-Economics/Math: Bake some chocolate chip cookies using "honey". Make sure the children do the math and counting! For extra math, have them double the recipe. For further honey-crafting, prepare some of these herbal honey recipes shared here! Foreign Language: Memorize how to say "bee" and "honey" in the foreign language you are studying. What colors do they notice in the painting? What has caught the attention of the little boy? Does he seemed scared of the bee? 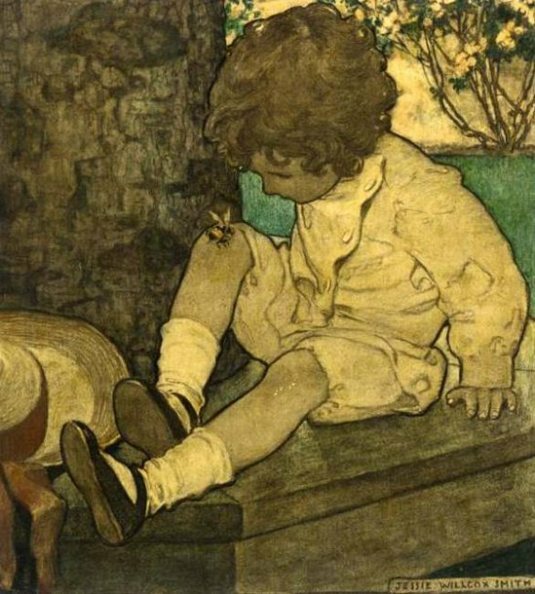 The artist of this painting, Jessie Wilcox Smith, is known for illustrating many children's books in the past. Have they even seen her paintings in their books? Here is a link to some of her illustrations. See if children can guess the books that they portray. Do they like this painting? Why or why not? Art: Draw a picture of a bee and color realistically or paint some bees. 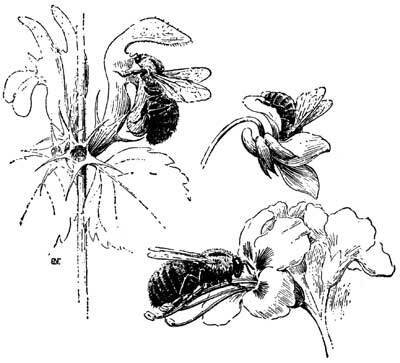 Art: Color in some pictures of bees (sample above) and/or our honey with Scripture coloring page. Arts/Crafts: Do some bee crafts. Field Trip: Go and visit a bee farm/apiary. 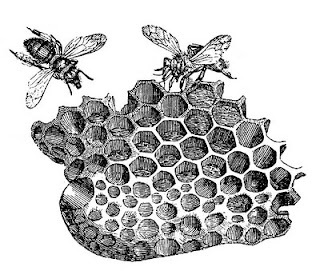 "My son, eat thou honey, because it is good; and the honeycomb, which is sweet to thy taste: So shall the knowledge of wisdom be unto thy soul: when thou has found it, then there shall be a reward, and thy expectation shall not be cut off". 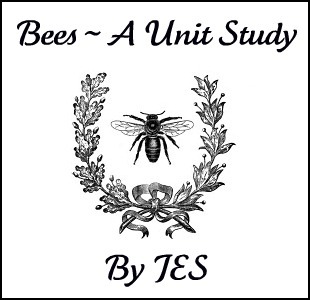 Visit HERE for more FREE Unit Studies!